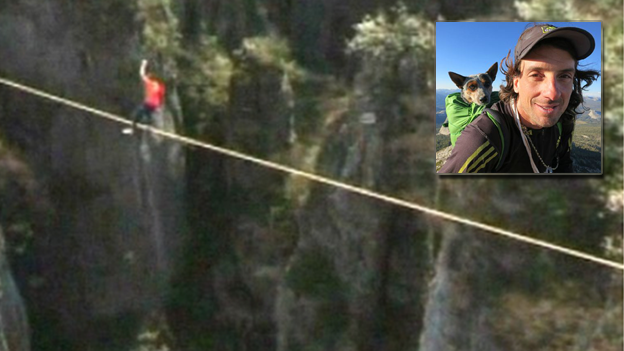 Dean Potter - one of America's best known extreme athletes - has been killed during a stunt in California. The 43-year-old died while attempting a wingsuit flight from the 7,500 ft (2,286m) Taft Point promontory in Yosemite National Park, a park spokesman said. Graham Hunt also died when their attempt to fly at high speed through a narrow gap in the skyline went wrong. Rescuers found the bodies soon after contact had been lost with the men. No parachutes had been deployed, reports say. Potter was regarded as a hugely innovative rock climber. He was also renowned for his high-line walks and high-risk parachute jumps, some of which he carried out with his dog.